As a youth, Pyrrhus of Epirus served as a lieutenant under the Diadochi, including Demetrius and Ptolemy. In 297 BC he regained his ancestral kingdom, and went on to seize the throne of Macedon. By 284 he was driven out of Macedon, and looking for new adventures. When Rome threatened expansion in southern Italy, Pyrrhus accepted an invitation from Tarentum to lead their fight in 281 BC. His campaign started badly when his invasion army of 25,000 foot, 3,000 horse and 20 elephants was scattered in its sea crossing, and he discovered a "wait and see" attitude among his erstwhile Greek allies in Italy. 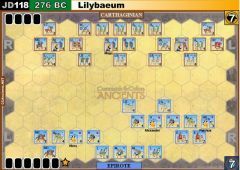 Pyrrhus needed a quick victory to change their attitude. Laevinus, moved south to deal with the Epirote invader. with a Roman army of two legions and allies - about 25,000 men. Both armies met near the river Siris. 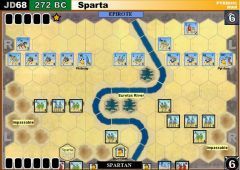 Pyrrhus could not prevent the Romans from crossing. In the early stage of the battle the Romans were getting the best of it, when Pyrrhus played his trump card and sent forward the elephants. No Roman soldier had seen one before and they were too much for the foot and cavalry alike. The Roman rout was on. There is little doubt the elephants were the key to Pyrrhus' victory, but it had been a bloody and hard-fought battle— 7,000 Romans and 4,000 Greeks were left on the field. 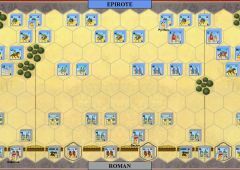 The victory swelled Pyrrhus’ ranks with new allies, but Rome was far from beaten. • The River Siris is only passable at the bends in the river. Treat the other river hexes as impassable terrain. 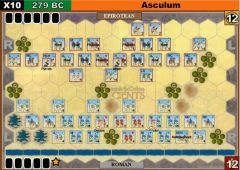 • Fright at First Sight: Any Roman infantry unit in close combat with an elephant unit may not ignore any flags rolled by that elephant unit, even if the unit has an attached leader or is supported by two adjacent friendly units. 3 different games. 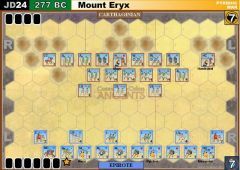 The first had Pyrrhus destroy the Roman cavalry left and shoot down part of its right making it a mopping up operation for the pike and elephants. The second saw the Roman left wing cavalry launch an assault which, with all seemingly going for it, failed spectacularly. 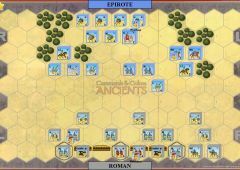 A central fight saw Pyrrhus eventually overcome the Roman centre with the loss of a phalanx and an elephant. The third saw fighting right across the board, the Roman left wing cavalry having some success but retreating intact despite heavy losses and within a hit of losing the lot. Lucky that the elephants couldn't follow-up to complete their destruction. Heavy fighting in the centre and some poor dice rolling from the Romans saw the entire Roman centre destroyed (3 Heavy Triarii, 3 mediums and 1 auxilia with Pyrrhus losing 2 phalanxes. If the Romans had of rolled more even average hits it could have been the reverse story. Terrific games and all different. All could have gone either way. Another convincing win to Pyrrhus at 7-2 with the elephants causing carnage, almost single-handedly taking out the Roman left and centre. 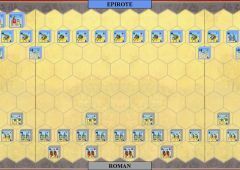 The only bright spot for the Romans was a medium infantry unit attacking Pyrrhus' personally-led phalanx and scoring 4 hits. Pyrrhus survived and the rest was doom for the legions of Rome. The game was played on for a couple more turns to see if Pyrrhus could turn it into a total rout and he did, advancing to a 12-4 wipe-out again. 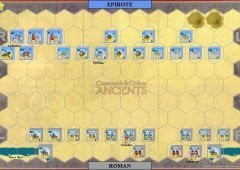 The Romans struck early with a couple of Double-Time cards and advanced the centre. 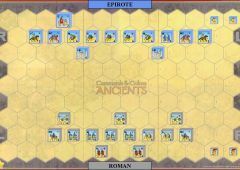 In the ensuing fight 2 Epirote phalanxes were destroyed along with an Epirote (Tarantine) medium unit. 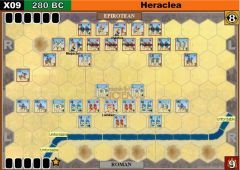 Pyrrhus survived and retrested to his reserve phalanx but held no Centre movement cards so looked in trouble. Pyrrhus choose to launch a Mounted Charge and caused significant damage to the Italian horse who Counterattacked but both sides' mounted struggled to score hits and finish the job. 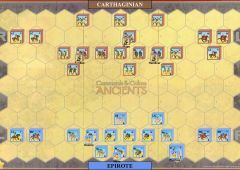 The Romans continued to try and finish off Pyrrhus but in the ensuing combat he played a First-Strike card and wiped-out a Roman medium unit. A couple of shots from the massed archers took out another. Finally Pyrrhus' mounted and elephants got stuck in and wiped out the Roman left and centre in two turns and the game was over, 7-3 to Pyrrhus. 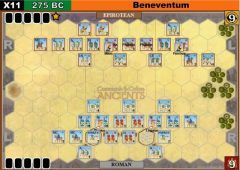 The comedy event of the game was Laevinus being shot dead with a double-leader symbols and an attack by the Roman heavy foot rolling no hits but 3 retreats on an elephant which was blocked to the rear and unable to retreat. Unfortunately one of the blocking units was Laevinus and his medium cavalry who took 3 hits for the elephant's retreats and then killed Laevinus as well. This single and final turn of events took the score to 12-4. An entertaining game and showed again that without the Command Cards you "think" you want (Pyrrhus with no centre movement cards), judicious use of what you have and a good combat roll or two can turn this game around. Just good fun.